Aaron Swartz, a celebrated internet freedom activist and early developer of the website Reddit, has died at 26. The activist and programmer took his life in his New York apartment, a relative and the state medical examiner said. His body was found on Friday. Mr Swartz began computer programming as a child, and at 14 co-authored an early version of the RSS specification. Leading internet figures and friends paid tribute to Mr Swartz via tweets or blogs. After leaving Reddit, Mr Swartz became an advocate of internet freedom, and was facing hacking charges at the time of his death. He was among the founders of the Demand Progress campaign group, which lobbies against internet censorship. The hacking charges relate to the downloading of millions of academic papers from online archive JSTOR, which prosecutors say he intended to distribute for free. He denied charges of computer fraud at an initial hearing last year, but his federal trial was due to begin next month. Mr Swartz's lawyer Elliot R. Peters confirmed the news of his client's death in an email to the MIT university newspaper The Tech. "The tragic and heartbreaking information you received is, regrettably, true," he wrote. A spokeswoman for New York's medical examiner later confirmed to Associated Press news agency that Mr Swartz had hanged himself. In a statement later on Saturday, Mr Swartz's family praised his "brilliance" and "profound" commitment to social justice and also expressed bitterness toward the prosecutors pursuing the case against him. Media captionHeather Brooke: "If the government wasn't willing to do it [give information] then he was on a guerrilla crusade to do it himself"
"Aaron's death is not simply a personal tragedy. It is the product of a criminal justice system rife with intimidation and prosecutorial overreach," the statement said. 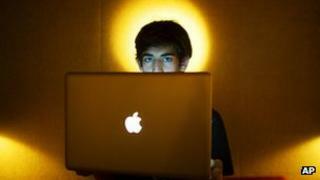 Sir Tim Berners-Lee - the British inventor of the world wide web - commemorated Mr Swartz in a Twitter post: "Aaron dead. World wanderers, we have lost a wise elder. Hackers for right, we are one down. Parents all, we have lost a child. Let us weep." Reddit's rise: Can the social news service stay popular?